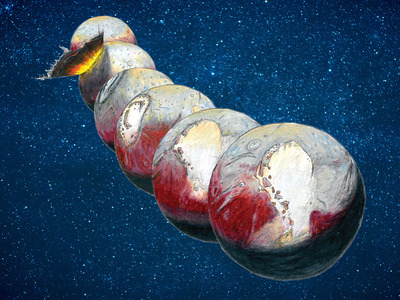 Pluto is hiding a very big secret some 3 billion miles away from Earth: a vast ocean of liquid water. Researchers announced their discovery of Pluto’s presumable ocean in two Nov. 16 studies in the journal Nature, both of which used data from the July 2015 flyby of NASA’s New Horizons spacecraft. Now a Dec. 1 Nature study further backs up that idea. Two questions on many researchers’ minds, however, are what’s in the water — and could it support alien life? Such chemicals could act like an antifreeze, making Pluto’s frigid, sub-freezing waters more slushy than liquid. The compounds might also form the chemical basis for life and consumable energy. But Bill McKinnon, one of the authors of the latest study in Nature, thinks it’s also laced with a noxious chemical found in bottles of window cleaner. Pam Engebretson/UCSCA cutaway illustration of Pluto. A global, liquid water ocean (dark blue) likely exists beneath the dwarf planet’s icy shell (light blue). Earth is proof that life is crafty and can eek out an existence in rough environments. Bacteria might even exist miles below Antarctic ice in permanently dark lakes of glacial water. So could strange forms of life also exist in Pluto’s global ocean? “Life can tolerate a lot of stuff: It can tolerate a lot of salt, extreme cold, extreme heat, etc. 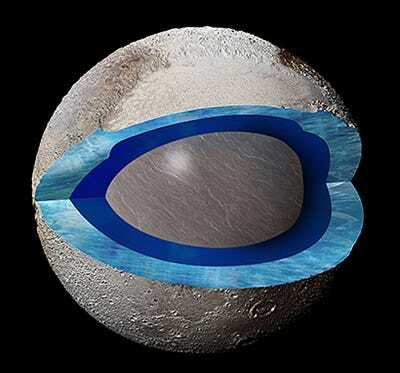 But I don’t think it can tolerate the amount of ammonia Pluto needs to prevent its ocean from freezing — ammonia is a superb antifreeze. Not that ammonia is all bad. On Earth, microorganisms in the soil fix nitrogen to ammonia, which is important for making DNA and proteins and such. Hand wouldn’t go so far as to say the dwarf planet could support life, but it might raise the chances of finding it elsewhere in the solar system or the Milky Way. The first-ever close-up images of Pluto from New Horizons revealed a 325,000-square-mile, heart-shaped basin of nitrogen ice, called Sputnik Planitia, that was littered with cracks and fissures. Computer analysis of the feature and Pluto’s orbit suggested something was off: Given the way Pluto interacted with its moon Charon, there should be a lot more material located at Sputnik Planitia. “It’s a big, elliptical hole in the ground, so the extra weight must be hiding somewhere beneath the surface. And an ocean is a natural way to get that,” said Francis Nimmo, a planetary scientist at University of California Santa Cruz (UCSC), in a UCSC press release. Back in November 2015, scientists announced their belief that Sputnik Planitia was created by a giant impact of some kind, which blasted away huge chunks of Pluto’s water-ice crust. “[W]e are almost certainly talking a [comet] strike out there, rather than a (rocky) asteroid,” Bob Pappalardo, a planetary scientist at NASA’s Jet Propulsion Laboratory who wasn’t involved in the new research, previously told Business Insider in an email. The new studies add to this idea, noting the catastrophe must have happened within the past 4 billion years and that the impact site was originally more than 4 miles deep. The giant scar has since sprung back and partly filled in with dense and heavy nitrogen ice, they found. Researchers also figured out with computer models that Pluto’s internal tides with Charon can’t be explained if the world was solid all the way through. “We tried to think of other ways to get a positive gravity anomaly, and none of them look as likely as a subsurface ocean,” Nimmo said in the release. Vance, who’s working on NASA’s mission to Europa — another ocean world, this one orbiting Jupiter — expressed no doubt Pluto indeed has an ocean. “A subsurface liquid ocean makes sense, given nitrogen’s insulating properties,” he previously told Business Insider in an email. While scientists continue to ponder the chemistry of Pluto’s new watery realm, New Horizons will keep on flying toward its next exotic and icy destination — the Kuiper Belt Object 2014 MU69 — at a blistering pace of 32,000 mph. It should reach the 30-mile-wide object in January 2019.